How Does All on 4 Dental Implants Work? Basically 4-6 dental implants can be placed to replace a full upper of lower set of teeth. The series of implants is used to permanently connect a full mouth implant bridge. Quite literally all your upper or lower teeth can be replaced on as few as four dental implants- hence All on Four. All on Four is now available using Cosmetic, Tooth Colored Metal Free Zirconia Implants! A full mouth of teeth can easily be replaced with metal free Zeramex Zirconia Dental Implants, Zirconia Abutments, and Zirconia Crowns. IV Sedation Dentistry is available for All on 4 in Rockville, Maryland. Dental Implants are invaluable to the Dental Implant Specialist. All on 4 dental implants is a method to replace a full arch of teeth supported by just 4 dental implants. Clear Choice is a national chain of dentists who promote practices limited to only dental implants. Clear Choice is a big promoter of the All on 4 dental implant solution to replace a full arch of teeth. Natural Dentist Associates is a Dental Implant Center and this service is available in Rockville MD and Burtonsville MD. There are some major differences we have with Clear Choice outlined below. All on 4 dental implants basically requires the patient to remove all remaining teeth. Once all the teeth are removed, 4 dental implants are placed and a bridge is fabricated with a span of 12-14 prosthetic teeth. The completed treatment consists of 4 dental implants supporting the forces normally placed on 12-14 natural teeth. Removing all your remaining teeth should be the last resort. You should never remove all you teeth as a matter of convenience. Dental Extractions should be the last choice and only perform when necessary. We do not do all on 4 dental implants. We do endorse the “All on 4 dental implant” approach, but we normally use at least 5 or 6 Dental Implants. Placing 1 or 2 extra Dental Implants is more biomechanically stable and is an inexpensive insurance policy. A full mouth (top and bottom) All on 4 case in the Washington DC area costs between $25,000 – $35,000. Seems like a huge investment to lose over the cost of an extra 1-2 implants. In fact, we include the extra implants in the costs because we would not allow you to take the risk of losing your entire case. 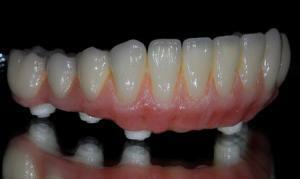 Will All on 4 Dental implants be able to hold the forces of 12-14 teeth over time??? What happens if a dental implant fails later??? Do the teeth ever need to be removed? Do the teeth feel natural? Is 4 stable enough or do we need more Implants? The jury is out as to whether or not dental implants are 3-4x stronger than natural teeth. But, no, as I have personally seen the failures in my office. If just one dental implant fails in an All on 4 dental implant case, the entire investment is lost and the entire case needs to be redone. 12-14 teeth can definitely not be supported by by 3 dental implants. The 12-14 tooth implant bridge will need to be removed, the failed implant will need to be replaced, and the entire 12-14 tooth bridge will need to be remade (since the 4th implant position will have changed and the original bridge will no longer fit). In most dental offices, the patient will have seen an oral surgeon or periodontist who has placed the dental implants and a second dentist (general dentist or prosthodontist) who has made the implant bridge. In the event of an implant failure, the implant dentist will most of the time replace the failed dental implant at no charge. The 12-14 tooth bridge is the problem since the fabrication costs alone for the bridge can cost over $10,000. No dentist is going to pay a lab another $10,000 in the event of a failure, and it may not even be their fault and in fact they didn’t place the implant that failed anyways. In some cases there can be finger pointing here. Implant retained bridges using All-on-4 rarely need to be removed especially if the patient does a good job of cleaning the bridge. On average the prothesis will need to be removed every 3 years, cleaned and replaced. Many implant centers offering only dental implants will finish All-on-4 dental implant solutions and not offer any future maintenance. Individuals seeking implant cases should inquire about whether or not future maintenance or service is offered. 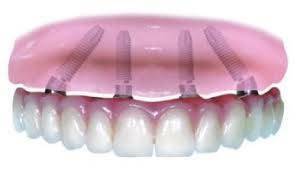 Implant retained bridges do not feel natural, they will however look like teeth, function like teeth and sound like teeth. After a period of time they will be comfortable and perhaps feel “natural”.